President Trump said Monday that there's a "good chance" for Middle East peace between the Israelis and Palestinians during his administration. "It'd be a fantastic achievement. 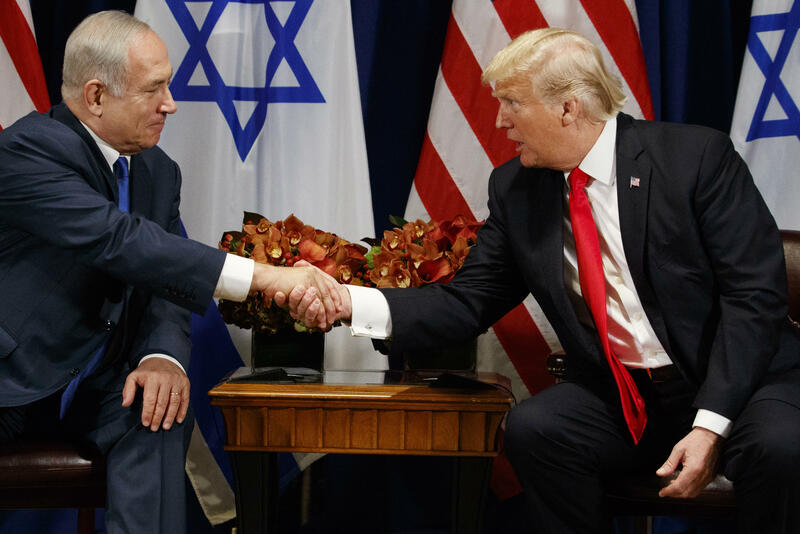 We are giving it an absolute go," Mr. Trump said during a meeting in New York with Israeli Prime Minister Benjamin Netanyahu. "I think there's a good chance that it could happen." The two leaders met Monday ahead of the United Nations General Assembly Tuesday in which Mr. Trump is set to deliver his first such speech at the annual gathering. Netanyahu said, "I want to say that under your leadership the alliance between America and Israel has never been stronger, never been deeper." He said he looked forward to discussing the "terrible nuclear deal with Iran." Netanyahu has always seen the Iran nuclear deal as a threat to Israel's security and has been one of the most vocal critics of the deal. He said he also wanted to talk about how to roll back Iran's "growing aggression in the region," including Syria. "I want to say, that under President Trump, America's position towards Israel and the U.N. has been unequivocal. It's been strong," Netanyahu said. Asked if he plans to remain in the Iranian nuclear deal, Mr. Trump said, "You'll see very soon. You will see very soon. We're talking about it constantly."